It’s unusual for me to be able to work different Pulp Fiction quotes into the Dave Knows Cars blog in the same week, but with this entry, I guess I did it… from the scene when Vincent Vega (Travolta) discusses his displeasure with a vandal who keyed his car after it had been safely stored for four years while he was in Amsterdam with Lance (Eric Stoltz), his Heroin dealer. 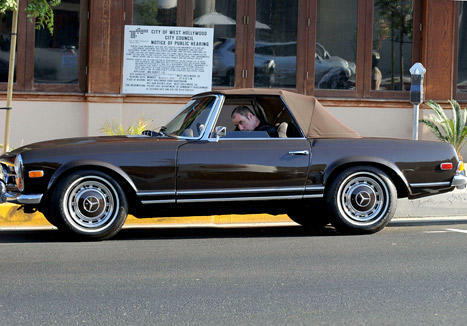 The short article below has been bouncing around different websites since last week when, apparently, John Travolta‘s 1970 Mercedes-Benz 280SL was stolen. One account quoted Travolta estimating the car’s value at about $35,000, other reports call it a $100,000 car. 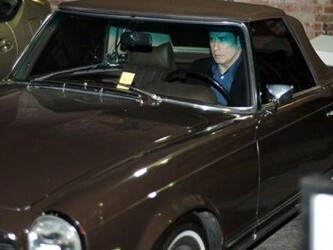 I’ve got to believe Travolta is much closer to the actual value of his car than the Hollywood reporters. According to Hollywood media reports, “Swordfish” actor left stranded in Santa Monica, California, as his car was stolen. A thief took 1970 Mercedes-Benz 280SL, and it was worth $100,000. He was at Jaguar dealership for a short visit, but as his car got stolen, he returned back to dealership and waited for the cops to make crime report. Reports also say that no suspect has been identified yet. Motoring enthusiast John, 57, has a large collection of cars including a Rolls Royce, and a Jaguar XJ6 as well as vintage Ford cars.